Above: Walter Sande in a publicity still for Universal’s 1943 war film Corvette K-225. Walter Sande, who worked in films and TV from the 1930s into the 1970s, could handle many types of characters. His square face suited him well in authority-figure roles, while his bulk made him an imposing heavy and his light and affable voice made him ideal in comic roles. He would play serious, villainous, and comedic roles alike over the course of his acting career, typically playing supporting character parts. 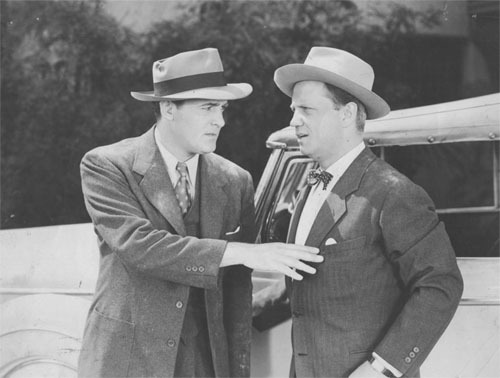 Among his few co-starring vehicles were three 1940s movie serials, most notably Universal Pictures’ two Don Winslow chapterplays. Walter Sande was born in Denver, Colorado, and spent a good portion of his childhood studying music. He pursued his musical interests as a young man, organizing a band while in college. He apparently arrived in Hollywood sometime in the 1920s, and worked as a musical director for Fox’s theater chain (a job that entailed providing live scores for silent films). The coming of sound and recorded film scores slowly rendered Sande’s job position obsolete, and by the late 1930s he apparently decided to go into the acting area of show business instead. He made his screen debut as a police detective in the 1937 Republic drama Tenth Avenue Kid and spent the next four years establishing himself as a character actor, playing bits as reporters, thugs, working-class types, and (most frequently) policemen. In 1940, he made his first serial appearance, popping up briefly as a racketeer in Universal’s The Green Hornet Strikes Again. 1941 found him in another small villainous bit (a crooked pilot who attacked the airborne hero but died in a plane crash) in Universal’s chapterplay Sky Raiders. Later in 1941, however, he played his first major serial role–and one of his first credited screen parts–in Columbia’s The Iron Claw. The Iron Claw was one of ten 1940s Columbia serials that were directed by James W. Horne–a former comedy director who repeatedly injected off-the-wall humor into his chapterplays. Most of Horne’s cliffhangers were rather uneven mixtures of comedy and adventure, but Iron Claw was so plotless and bizarre that it emerged as a full-fledged comedy. Sande played Jack “Flash” Strong, the photographer sidekick of reporter hero Charles Quigley; the two newshounds got involved in a mystery involving a wealthy miser, his greedy relatives, gangsters, and a mysterious killer called the Iron Claw. Claw was a very amusing spoof of the serial and mystery genres, and Sande was one of the cast’s most amusing members, handling his bumbling character’s many one-liners and pratfalls with real comic flair. 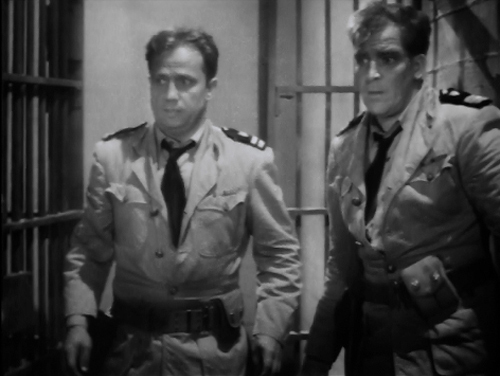 Above: Charles Quigley and Walter Sande in The Iron Claw (Columbia, 1941). Soon after Iron Claw, Sande landed a recurring role in Columbia’s Boston Blackie B-movie series, playing the lovably dim-witted police detective Matthews. He appeared in five Blackie movies from 1941 to 1943, while continuing to play character bits in many other films. Late in 1941, he appeared in Universal’s serial Don Winslow of the Navy, playing Navy lieutenant “Red” Pennington, who helped Commander Don Winslow (Don Terry) track down a ring of spies and saboteurs on a tropical island. An entertaining serial, Winslow featured strong performances from its leading actors, Sande among them. He established an excellent rapport with Terry and played Pennington in a breezy, slightly flippant manner, while maintaining properly military seriousness in tense situations. 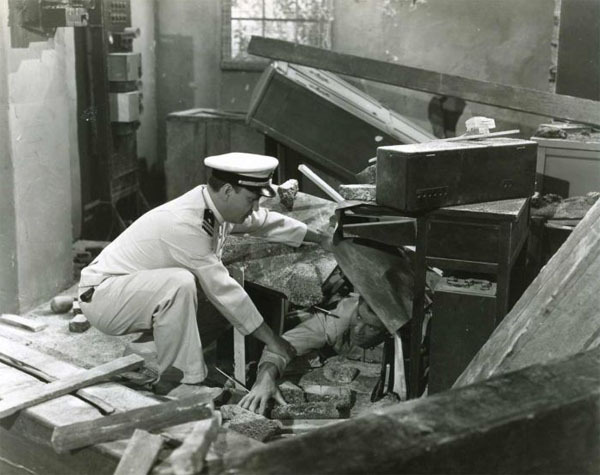 Above: Walter Sande extricates Don Terry from a demolished building in Don Winslow of the Navy (Universal, 1941). 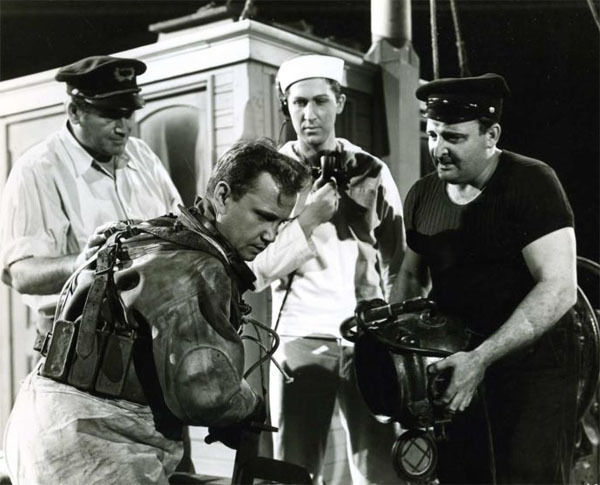 Above: Diving-suited Walter Sande prepares for an underwater rescue of a trapped submarine in Don Winslow of the Navy; Peter Leeds is the sailor in the middle. 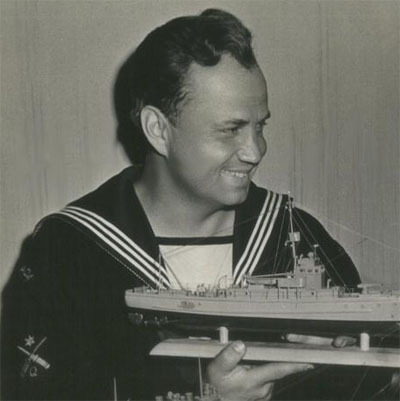 After some more feature-film work, Sande appeared in his final serial, Don Winslow of the Coast Guard (Universal, 1942). This exciting sequel to Sande’s previous serial had Winslow and Pennington reassigned to the Coast Guard to combat the stateside sabotage efforts of an Axis spy ring. Again, Sande delivered a well-balanced performance, supplying a light touch to dialogue scenes and providing tight-lipped support in action scenes. He also managed to deliver a series of propagandistic anti-Axis witticisms in a cheerful and offhanded way that made them seem much less strident than many other wartime films’ wisecracks. 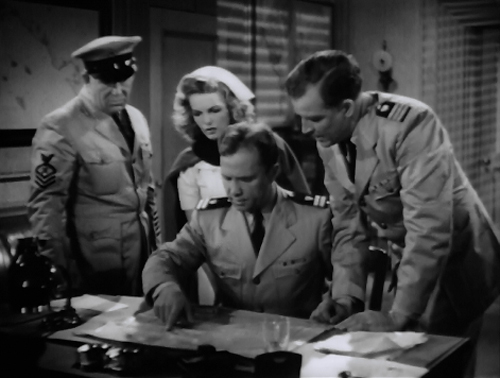 Above: Walter Sande (seated), Edgar Dearing, Elyse Knox, and Don Terry (standing left to right) figure out where the Scorpion and his allies plan to strike next in Don Winslow of the Coast Guard (Universal, 1942). Above: Walter Sande and Don Terry cautiously prepare to slip past a rigged machine-gun that may or may not have discharged all its bullets in Don Winslow of the Coast Guard. Sande began to move up Hollywood’s character actor ladder as the 1940s progressed, playing credited roles more frequently and working in many A-films (To Have and Have Not, Along Came Jones, Gung Ho, and others). He continued his string of movie appearances into the 1950s, appearing in science-fiction films (War of the Worlds, Red Planet Mars), Westerns (Fort Worth, Wichita), and everything in between. In the mid-fifties he began concentrating chiefly on television work, appearing semi-regularly as a police captain on the 1950s version of Dragnet, co-starring in the short-lived 1957 comedy series Tugboat Annie, and making guest appearances on other shows. The 1960s saw him working almost exclusively on TV, playing prominent guest parts on shows like Laramie, 77 Sunset Strip, and Bonanza; he also played another semi-regular role as star Inger Stevens’ father on the 1963-1966 show The Farmer’s Daughter, while making occasional movie appearances. His final big-screen role was a character part in Bob Hope’s 1965 comedy I’ll Take Sweden, but he continued his television work for six more years. His last acting assignment was a role in a two-part 1972 Wonderful World of Disney episode, “Michael O’Hara the Fourth.” Several months before this show aired, Walter Sande died of a heart attack while visiting Chicago. Walter Sande is one serial sidekick who is probably better-remembered for his extensive work as a film and TV character actor than for his cliffhanger appearances; the chapterplays he figured prominently in all happen to be among the genre’s lesser-seen entries. However, Sande’s serial work–most particularly, his two Don Winslow serials–definitely earns him a place among the genre’s best supporting heroes. In the Winslow outings, Pennington the Navy officer needed to seem competent enough to pass muster with wartime censors yet funny enough to provide a good counterpoint to the hero; Sande did a splendid job with the difficult role and made Pennington a standout among serial sidekicks. 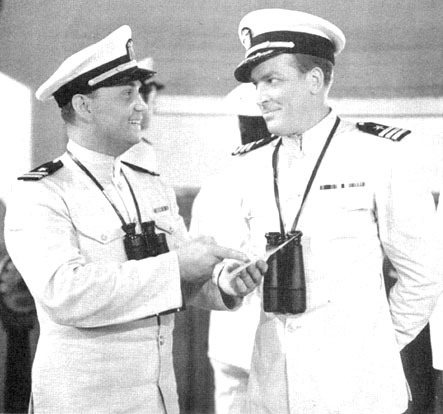 Above: Walter Sande with Don Terry in Don Winslow of the Navy (Universal, 1941). Acknowledgements: I am indebted to Gary Brumburgh’s Internet Movie Database biography of Walter Sande for the biographical information in this article.